Stoke City and Burundi striker Saido Berahino has been arrested in London on suspicion of drink-driving. The 25-year-old was detained after reports of a "disturbance" in Great Russell Street in the capital's West End at about 03:00 GMT on Monday. "When officers arrived on scene a car was seen to drive away at speed," a Metropolitan Police statement said. "The car was stopped in Bedford Square and a 25-year-old man was arrested on suspicion of drink-driving." Scotland Yard said Berahino told officers he had been the victim of a robbery in Great Russell Street. "He alleged a group of males surrounded his car in Great Russell Street and attacked him, stealing his watch," the force said. 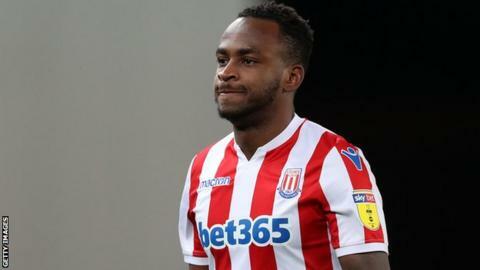 Stoke did not comment on Berahino's arrest, but it is understood he will be dealt with internally under the Championship club's disciplinary policy. Berahino has scored five goals in 26 appearances for the Potters this season. He was not in the squad for Saturday's 1-1 draw at Ipswich in the Championship.